With the colder temps, date night and holiday hair can be made difficult. Especially since the winter months have most of us wanting to seek refuge under a layer of blankets and not spending hours styling our hair. Thankfully, there’s a fast and easy alternative that still leaves you looking glamorous and polished for all of your seasonal soirées: buns! With a few bobby pins and twists, you’ll look like you spent the afternoon at our salon, not cuddled up on the couch! Check out the three knots and buns we can’t get enough of this winter. A top knot or a high bun instantly conjures images of perfectly coiffed ballerinas. This simple style brings your face front and center and looks beautiful when paired with a dazzling pair of earrings and a bold red lip. The key in styling a top knot just right is in where you position the bun paired with confidence. 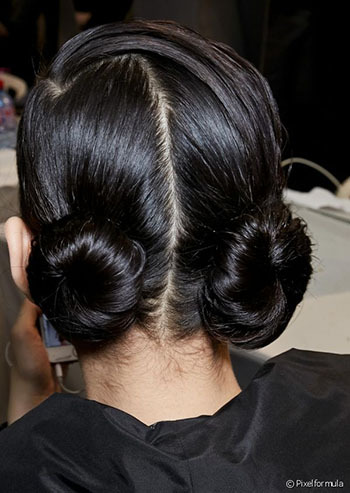 If you prefer your updo to have a little whimsy, double buns are in order. Worn high or low, double buns give off a youthful vibe that looks amazing with the season’s chunky knit sweaters. What’s more? Styling is a breeze! First, distribute Tecni.Art Volume Envy Extra through damp hair and dry your hair using your blow-dryer’s lowest setting-air drying during the winter can be rough. Next, use a long-tail comb to create a straight middle part and then create high or low pigtails, being careful to smooth out any bumps with the other end of the comb. Braid or twist each section and then wrap the length around the base, securing with bobby pins and a little hairspray! Use your fingers or the long-tail comb to gently tug at each bun to shape it. Looking for a romantic bun worthy of all of your special events this season? Look no further than a low chignon. You can style this effortless look using freshly curled hair or even with next-day curls for a whole new look! To start, use a volumizing mousse and blow it into your hair with a blow-dryer. After your hair is dry, create a deep side part and use a 1-inch curling wand and curl sections of hair away from your face to create soft waves. Next, tie your hair into a loose, low side ponytail on the opposite part. Allow a few face-framing pieces to naturally fall for that ethereal-looking vibe. Then, divide the ponytail into two sections and twist them around each other three times, securing with a clear elastic. Finally, wrap the twist around the base of the ponytail, secure with a few bobby pins, and spray with a light-hold hairspray.